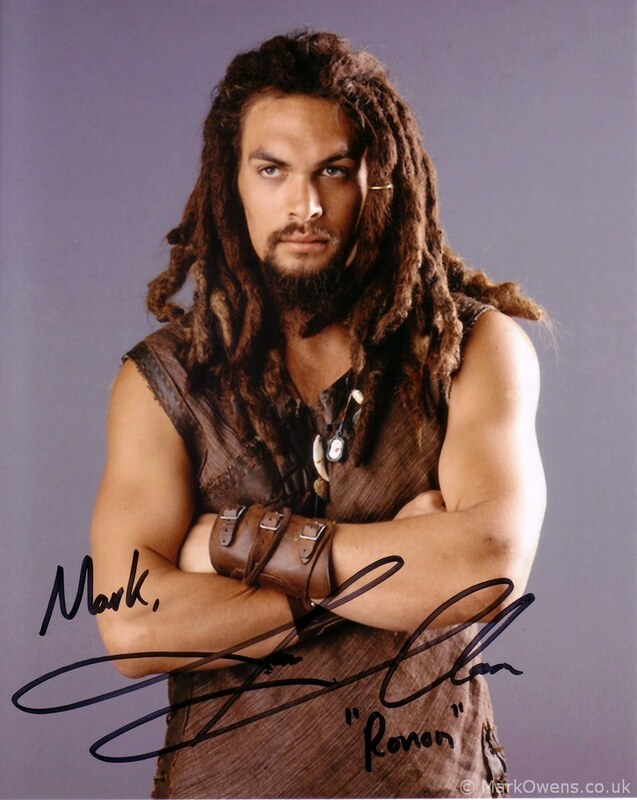 stargate atlantisin sert cocogu, ronon dex. karizmatik bi tipi var, rastalar vs lakin..
1979lu honolululu yavru"**. 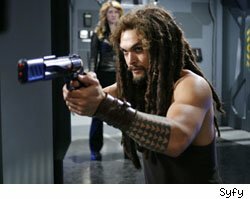 stargate atlantis'i cekilir kilmak her babayigidin harci degil nitekim. lisa bonet* ile bir kizlari vardir. baywatch hawai'de oynamışlığı vardır tıfılken. adama allah bi cüsse vermiş fantastik filmde oynasın diye. game of thrones'da da oynuyor. yaklaşık bir buçuk yıl önce yeni conan the barbarian ile ilgili haberleri okur iken varlığından haberdar olduğum ve kendisini bilmeden yaşadığım her güne lanet ettiren aşmış, insan üstü varlık. "game of thrones başladı, izleyeyim hemen tey tey tey" diye sevinir iken kendisinin de kadroda olduğunu öğrenmemle ateş bastı durduk yere iş ortasında. uzun çabalar ve resimlerine uzun uzun bakmalar, videolarını tekrar tekrar izlemeler neticesinde tek kusurunun lisa bonet ile evli olması olduğuna kani oldum ve 30 senedir dünyada olan bir naçizane kadın olarak şahsi kanaatim şudur ki; elimdeki mevcut bilgiler ve veriler ışığında erkek güzelliğinin varabileceği son noktadır jason momoa. nokta. bu deveden conan olmaz! arnold, bunu yumruklasa yeridir. servet çetin dururken game of thronesda rol alan oyuncu. oldu mu şimdi hiç. the show's really highly anticipated - do you feel under pressure? "i love it so i don't... the books are amazing. the script and the way [the writers] david [benioff] and dan [weiss] translated it from the book, it's like a gigantic movie. the budget's huge. i think it's going to be great. in america they're going to love it. once you get past the first two episodes - because obviously there are like 50 characters you've got to set up, they've got to last for like seven books eventually - it really speeds up and the action gets pretty intense and the stuff that happens. the way [author george r r] martin sets up the characters... obviously my character's just this stoic intimidating king, and you see his warm underbelly. once you let that open up you're going to see he does become frail. he starts really strong. and you see daenerys [emilia clarke] starts very frail and becomes very strong. it's set up in a way where your bad guys are good and your good guys are bad. so it's very rich with the characters." 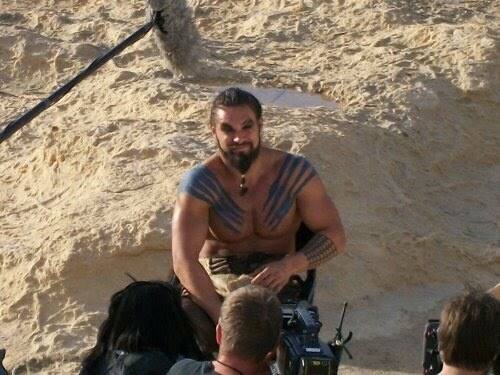 did it make it harder for you to set up the character when he doesn't speak english, only dothraki? "it did. it was very scary, because when i auditioned for it i did it in a broken english. and i get there for the table read - 50 people there - and the writers are like, 'hey, we got this great berkeley linguist who invented this language... we just think it's better if the whole race won't know how to speak english, it's just this little white girl who learns to speak dothraki'. i'm like, 'right. wait. so the whole monologue and the speeches i have - these war speeches and this great stuff - it's going to be in this language that's made up, is that right?' and they're like, 'yeah, just wait until you get it, it's amazing. it's like german and arabic'. i barely speak spanish! i get it and i'm just like, 'f**k! this is an honour but how am i going to do this?' i locked myself in with some guinness and some pizza and went to work. it's the greatest thing i've ever done to date. i don't think i'll ever have a role quite like this ever again. some of the stuff i get to say in general is stuff that's never been on tv. some of the things i get to do have really never been on tv. and then to put it in a made up, foreign language that you have to stay true to to honour the fans... so you just memorise it and then once you get it in it's just knowing what you're saying. you've also got to memorise everyone else's lines as well - you can't sit there like a deer in headlights or fake it. you have to understand what they're saying so you can react. you really have to submerge yourself in the role."